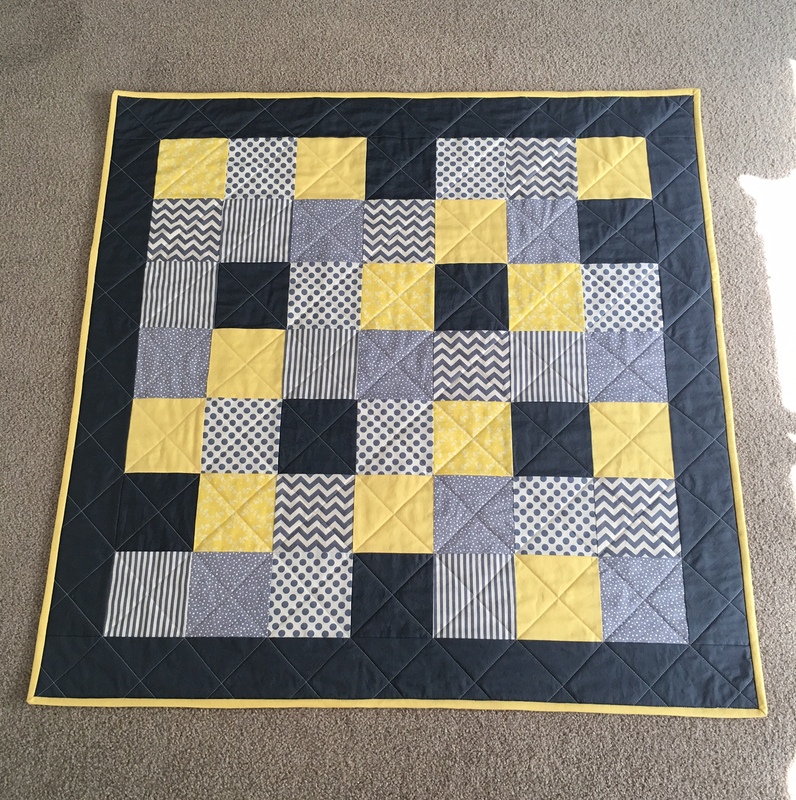 Update – Yellow & Grey Baby Quilt + Cushion! So remember when I showed you guys the gorgeous yellow & grey fabrics I had to work with for my latest commission? My client wanted a simple patchwork pattern for the quilt, so I cut 6.5″ blocks, 7 blocks across to create the middle of the quilt. On a side note, does anyone else think things look better in odd numbers? I’ve heard interior designers generally recommend decorations in odd numbers ……. Anywho. 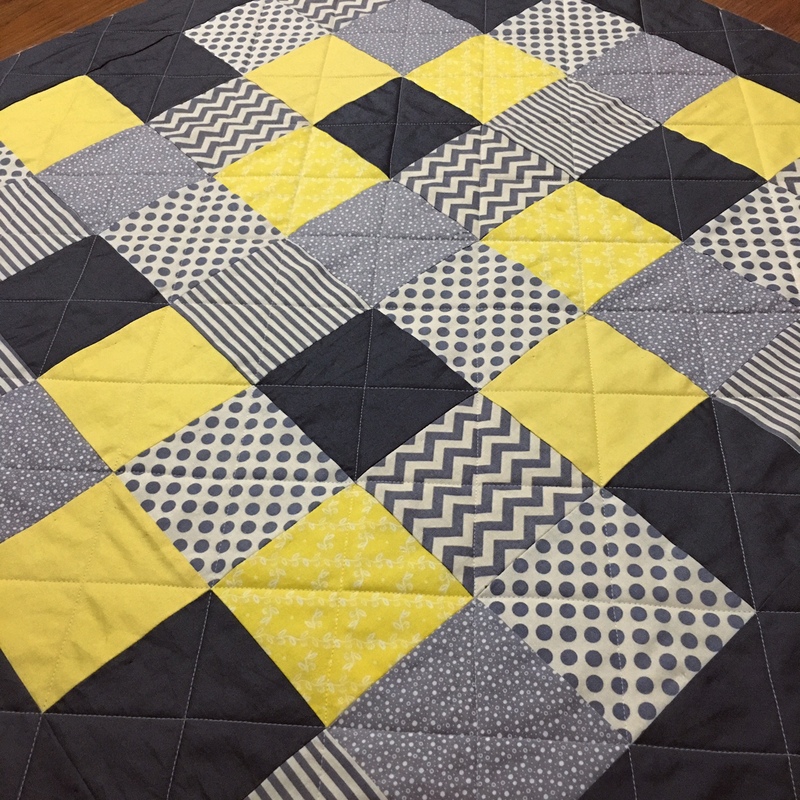 I bordered the patchwork in the dark grey and used bright yellow fabric to make my own binding to really make the grey pop. I did a simple criss cross quilting pattern, as I thought the fabrics were busy enough as it was. I am really happy with how it turned out and I love the criss cross quilting effect. The backing is a light grey polka dot fabric that goes really well with the yellow binding, and due to the colour of fabric backing, the criss cross stands out even more which is lovely! The cushion is also complete, and I had such a ball with this pattern. I was trawling Pinterest to find inspiration and found a pin that I’ve had saved for a long time; a strippy pillow tutorial. Check out Jera’s blog for the instructions on how to make your own. I’m super happy with how the cushion has turned out. When you run your hand over it I love the feel you get from the different strips of fabric. 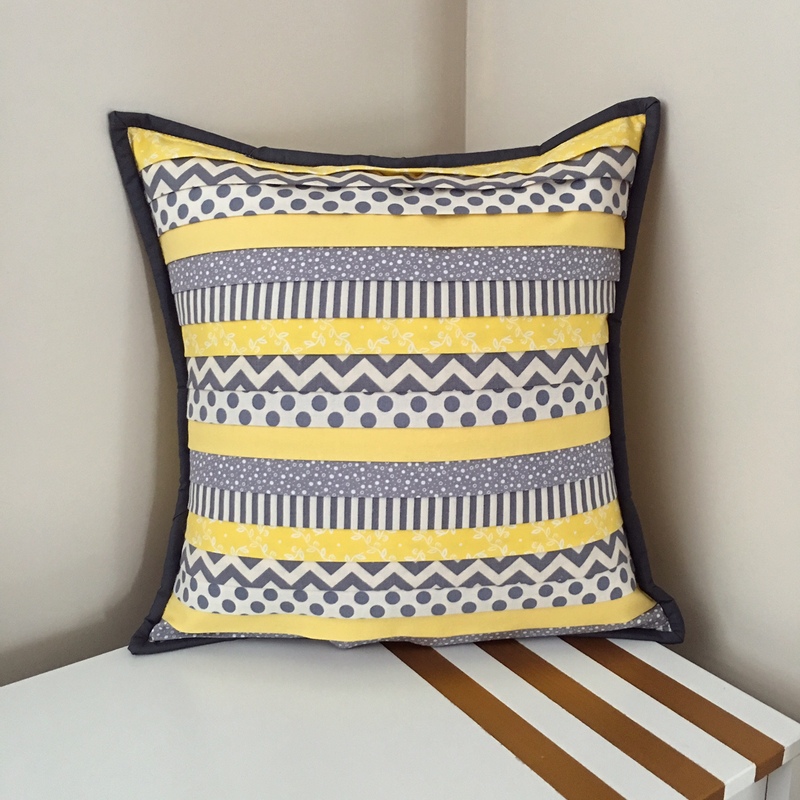 The backing is the bright yellow fabric with a concealed lapped zipper; the yellow backing really pops against the dark grey binding of the cushion. Speaking of which – if you guys have any advice on how best to take photos of quilts, I’d really love to know. I struggle to take good photos of my items, and my goal is to set up my Etsy store this month … I feel like I need to nail good photos so any advice would be much appreciated! – Are you using a walking foot when you’re quilting? – Have you basted the quilt well, ie. did you use spray adhesive to baste, or lots of pins? I’m personally a pin baste kinda of gal, but I make sure I use LOTS. I used to find the movement in my fabric occurred due my ineffective basting – either my fabric wasn’t laid flat when I basted, causing ‘air bubbles’ whilst quilting which would cause the fabrics to shift and ripple, or I hadn’t basted using enough pins. I also noticed a huge change when I started using a walking foot to quilt. A walking foot effectively pulls all 3 layers through at the same time, to prevent fabric shift and give you better control whilst quilting. When I didn’t use a walking foot my top layer would also move through quicker than my bottom resulting in the fabric shift you might be experiencing. Another thing I find is ensuring my quilt is well supported whilst I quilt; don’t leave the bottom laying too far down your lap or on the floor whilst you quilt because the weight of the quilt can cause issues whilst you’re quilting – you’ll feel tension in the area you’re quilting if this is happening. If I notice this happening, I readjust the positioning of the quilt to make sure the excess is well supported. For me, it was just a practice thing and I read a lot of other people’s experiences to see if they had any advice. In all honestly, I think a tiny bit of fabric shift is normal, which is why we always cut our backing fabric and wadding large than our front. They look great! The colors and mix of patterns work beautifully. Love those colours! That quilt is awesome! Gorgeous wee quilt and quilted nicely, hate it when a quilt you use on a baby or small childs bed is quilted to death and looks so cardboardy! This one remained nice and soft in looks, well done!